These cushions have great loft and don't compress. They have given new life to some old uncomfortable chairs. The ivory color is very light and bright - Closer to white than khaki or beige. Blazing Needles 16-inch U-shaped Twill Dining Chair Cushions (Set of 2) - 16" x 16"
Add comfort and support to your dining chairs with these Twill Dining Chair Cushions. 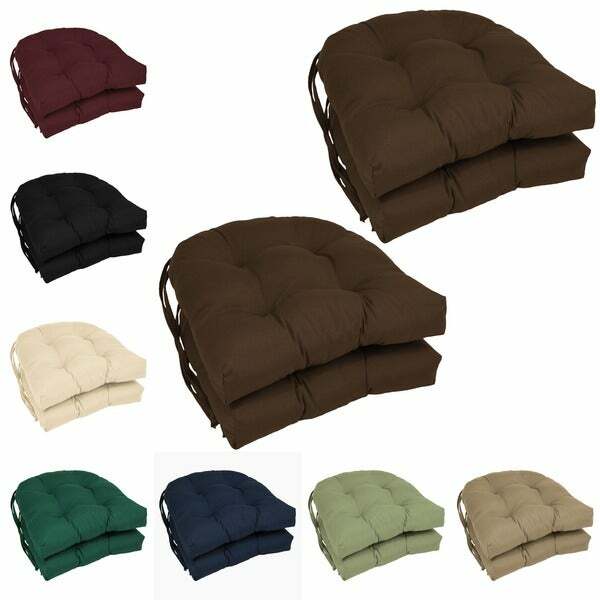 These U-shaped cushions come in a set of 4 and available in eight different colors to suit your preferred taste. The cushions will fasten securely with the included fabric ties. They are designed with a classic tufted cushion style that is sure to add a touch of elegance to your dining set. These cushions will no doubt add color to your decor. These chair pads are made of high quality material but one warning. I had to send these brown ones back as they were to small for the chairs I had just purchased from Overstock. I never realized until they came that chair pads came in two sizes. A 16 inch and a 19 Inch which I had to get. Be sure and measure your chair seat before ordering. Needing new seat cushions, I went directly ot Overstock and found exactly what we needed and liked. Sturdy, fashionable, padded nicely, and reasonabley priced! Overstock never disappoints! I needed to replace the cushions on my dining room chairs and after much indecision, ordered the twill cushions. The rich navy color matches my dining room rug perfectly and the cushions are thick, contrary to some of the reviews I read. The cushions could use two more inches on either side to totally cover our handmade Amish chairs, but they will work. If there is one thing I would like to see changed, it would be to not sew the 3 inch white tags into the edge of the cushions. I cut the tags off, but a sliver of white remains and is very visible against the navy blue. It's true that the cushions were simply packed in a cardboard box for shipping, but I appreciated that. Why contribute to unnecessary packaging? The green Blazing Needles 16 inch u shaped cushion set match our front patio umbella and are very comfortable. my wife is very happy with the cushions. Bright and fresh. They look great with my newly painted wrought iron set. Colors are as pictured--got the bright scarlet and yellow striped cushions. 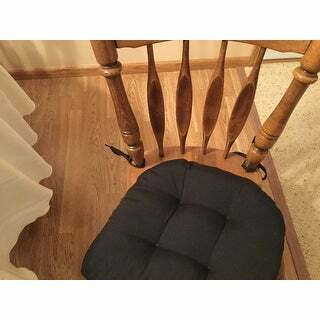 They're thick and comfortable and fit my chairs perfectly. The velcro attaching straps are neat and sturdy. The ties always seem to bust--these look like they will last. Happy with my purchase. This is my second set of cushions to order. First set was returned as they were larger than the measurements given. (16" U shape) Ordered another set in a different fabric, same size, These are too small and do not reach the edges of the chairs. I kept these thinking they would "spread out" and cover the seats but they have not done so. A disappointing purchase. I was pleased with the style of chair cushions, the quality is great, color perfect and I have always wanted ties on the cushions. I also needed extra cush and these are fine for that. However, now that I ordered the 16 inch chair cushion I might return them and get 19 inch. My chairs are larger then I realized. If I return them will leave a review on how customer service is to work with. My friend tells me she was very pleased with them. These cushions are very comfortable, they don't slip. They add class to my dining area. I would recommend these. I have been redecorating my kitchen. 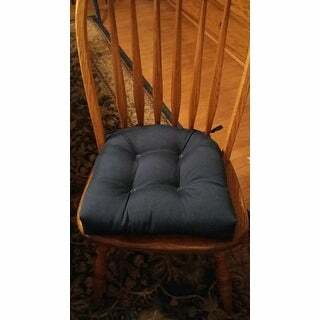 A while back I ordered the twill dining chair cushions to replace the ones I ordered from you a few years ago. The new cushions have been on the chairs for two weeks. So far the ties have come off on 2 of the cushions and left nice holes with the white filling showing. Very unhappy with these cushions. Cushions make sitting at the dining table more comfortable. And my cat adores them. She loves to sleep on a dining room chair now!! Almost all of the ties came off the pads within 2 days of use. This with adults and tw meals! Color was perfect, but these cushions are not very thick and don't make a hard wood chair as comfy as I would have liked. I just needed good solid navy blue cushions to replace my old ones while updating my kitchen. These are well made, and the material feels as if they will last a long time. I was very happy with this purchase! Slightly thicker than I expected. But that's good. Color was right on. It took a while to get them, but well worth the wait. Would definitely order these chair cushions again. Don't waste your money. Splurge and get the better ones. Poorly finishing work. One of the gatherings made to look like a button on the seat has already come loose after only 3 months. Disappointing. Nicely constructed. But too small for chairs . Our chairs are a full 16". These are barely 14". Maybe the fabric measures 16" before they put the stuff in in. Much smaller than advertised. Nice color and decent fabric make sure you only need 14"
These are well made and I love them. They have thick padding. I would buy them again. The chair cushions are so comfortable and the color is just as pictured and look perfect next to my kitchen decor. the ties that hold the cushions aren't very well made, I had 2 ties that ripped off. other than that they're very comfortable. Very nice chair cushions for the money. Nice color and well made. Highly recommend! "are these cushions reversible or do they have the skid proof on the bottom?" "If these are U-shaped, what is the width at the back end of the cushion? My chair will accommodate the 16" at the front, but the construction at the back narrows so that it will accommodate a smaller width, 13" or maybe a bit more." The cushions are 16" wide, 16" deep and 12/13" wide in the back. "I NEED 4 12â or 13â ROUND DINING CHAIRS PADS IN HUNTER GREEN, IF POSSIBLE. EVERY PAD I LOOK AT IS EITHER 15â or !6â ROUND. TOO BIG!!!!! I PREFER COTTON, BUT IT IS THE SIZE THAT IS THE PROBLEM. DO YOU CARRY THIS SMALLER SIZE, IN ANY STYLE?" Hello Christine J. P., we do not currently have a round chair pad in 12 or 13 inches. The smallest size we have is 14 inches, you can refer to item number 12435449 if you'd like to look that size over. Thanks for shopping with us! "16" is not large enough. Do you have forest green available a few inches larger. I need 8 cushions"
Hello bette7, this item is not offered in a larger size. However, see Item 15084670 and 13475066, for similar items in different sizes and colors. Thank you for shopping with us. "Is it possible to get a fabric swatch? I'm having trouble finding the right shade of red or burgundy." Hello kathys53, I'm sorry we don't have fabric swatches available. Have a great day! Hello tazman49, thank you for your interest in the Blazing Needles 16-inch U-Shaped Twill Dining Chair Cushions (Set of 4). No, this is not machine washable. It is spot clean only. Thank you for shopping with us, and have a great day!